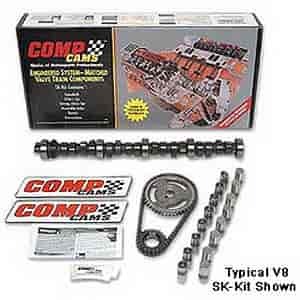 COMP Cams High Energy Mechanical Flat Tappet Camshaft Small Kit Chrysler 225ci 6-Cyl 1960-1987 Lift: .440"/.440"
Excellent choice for trucks and towing. Good power in low-mid RPM. Smooth idle. Comp Cams High Energy Camshafts are designed for street engines with an 8:1 to 9:1 compression ratio. They also work well with stock components, including intakes, exhaust manifolds, and carburetors. These cams offer strong gains in both gas mileage and power throughout the RPM range for most street applications. Does COMP Cams SK64-241-4 fit your vehicle?